Europa League favourites Arsenal and Atletico Madrid avoided each other in the draw of the competition’s quarter-finals on Friday. 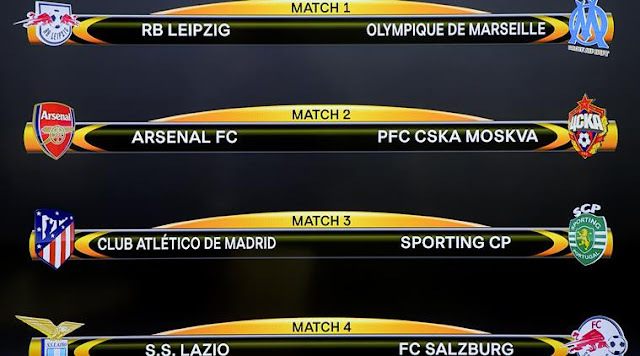 The English side are paired with CSKA Moscow, while the Spaniards are pitted against Sporting. Bundesliga side RB Leipzig were drawn against Olympique Marseille and Lazio, Serie A’s only survivors, will take on Salzburg, the surprise package among the last eight. The Austrian champions are unbeaten in 12 matches in the competition this season and knocked out Borussia Dortmund in the previous round. Unlike the UEFA Champions League, which is dominated by a handful of elite clubs, the less prestigious UEFA Europa League tends to be more unpredictable. This is evident in the fact that Friday’s draw featured clubs from eight different countries. Arsenal are now 12 points adrift of the UEFA Champions League places in the English Premier League. Their only realistic hope of returning to Europe’s top club competition next season is as winners of the Europa League. The London side, who knocked out AC Milan in the last round, are likely to be relieved to be facing the Russian side rather than Atletico, who won the competition in 2009 and 2012.